I am happy to announce that you may now Reserve in advance your copy of our very first Piano Lesson Report from Piano Encyclopedia: Music Fundamentals. You can reserve your spot to not only receive the first Piano Lesson Report, but for all our advanced subscribers that register before October 5th at 4pm EST we are going to offer you also our bonus piano-charts, in addition to everything that’s included in our first report. With Piano Lesson Report One, we’ll be stressing on understanding of the relationship between chords, scales, and music intervals– right at the beginning- so now you’ll be able to see songs from another perspective and advance quite fast, as we move quickly into the world of composing, improvising, and understanding music! We’ve created a video for all our viewers to watch as an additional feature for Music Fundamentals Lesson Report I. These videos are something you will see more then once so feel free to leave comments on what you thought about it! Now you are probably wondering, what exactly is this bonus and why is this Piano Lesson Report so special? Lets see, included into our Piano Lesson Report there is vast amounts of information -more than 55 110 pages, 112 150+ illustrations, and 7+ Piano Charts, and the bonus we are offering you will make things even more interesting and exciting. How about I give you another sneak peek into Music Fundamentals Lesson Report I. 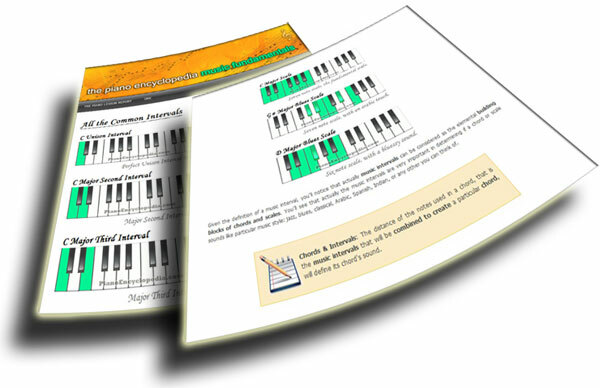 Take a look at some of the graphics that you’ll see throughout the entire Music Fundamentals Lesson Report I. We’ve included so many useful graphics and images that you will get a great feel for all the various chords and intervals that you can play on your very own piano. With our very first Piano Lesson Report we will begin you on your way to learning some of the basics involved with the piano and with the upcoming Piano Lesson Reports that are to follow you will have the chance to continue learning even more about composing, improvising, and taking your piano skills to the next level. As of today you will have 9 days 2 days (and counting…) to reserve your spot by simply registering your First Name and Email address, we will send you our first Piano Lesson Report as a thank you for following our events over the past few months and send you the additional bonus offer if you subscribe before our release date. If you’re already receiving our newsletters, you’ll automatically receive our Music Fundamentals Report I. However, we’re also very interested in knowing which users are most active as we’ll be opening our first beta-test of the Piano Encyclopedia’s Community in the next 3/4 weeks, with a small number of users. So we have prepared a special deal for you guys, and we have specified everything on the newsletter emails, to tell you how you can get to be one of the first ones to try out The Piano Encyclopedia’s Community. This way, we’ll give priority to not only the users that have registered earlier but also to the most active ones. ALL users will eventually get access to the beta-testing but the first round is going to be with a small number of users -which will be the first one to experience our new community – in order to fix all the most important details, before letting everyone in. Therefore if you’re already signed up to our newsletter we’re asking you to please follow the instructions we’ve sent to your email to become part of the Piano Encyclopedia’s VIP List, and to thank you, not only we’ll have more consideration in choosing you as one of the first users to become part of the first beta round of The Piano Encyclopedia’s Community, but we’ll also be sending you some exclusive piano chart bonuses with our piano Lesson report one. If you’re not receiving our emails yet... You may subscribe to our list to get into all the action, get the bonuses, the report, and be considered into the next beta-tests, and receive the next free releases. There is so much in store for all of our followers and we are more then ready to help everyone be on their way to taking their piano skills to the next level. I’d like to thank everyone that has followed along with our progress so far and the great support you’ve all given. If you have any questions or comments please don’t be shy. I love receiving all feedback and questions from everyone and growing a great relationship with all of you. PS. We are only leaving the advanced subscription up for 9 2 more days (and counting… ), that means on October 5th at 4pm EST we will no longer be accepting any more advanced subscriptions to receive the first Piano Lesson Report with the additional bonus. Secure your Spot Now to receive all the details I’ve just talked about and much more. Another update will be coming your way soon, so make sure you come back and learn some more about what we are going to offer you with our very first Piano Lesson Report. Really can’t wait till October 5th!! This is truly going to be quiet exciting.